I searched the internet for plates divided into portions that represented food groups to see how they compare with the USDA's new food icon. The earliest divided representational plate is the Passover Seder Plate. It has six partitions either labeled in Hebrew or defined by pictures of symbolic foods. The sheer variety of beautiful seder plates might have helped the "committee" of government plate designers that spent $2 million on their underwhelming design. 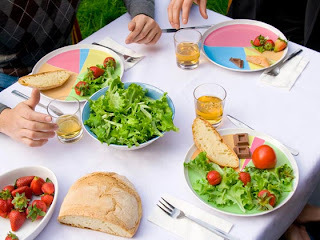 Diabetes and More.com has a collection of three food portion control plates addressing different demographics. The plates use symbols that suggest sizes. For the non tech eaters, a light bulb, fist, deck of cards, and baseball. A mouse and CD are used on a different plate, and plate for kids has crayons and a yo-yo. These images add some dimension to the pie shaped images used on the government plate. Attractive they are not. PCRM, the Physicians Committee for Responsible Medicine, has a plate that specifies protein as legumes. They state there is no reason for animal products in our diet. You can click on the plate and see food choices and recipes. The USDA's icon is also clickable, if you can figure that out. They need to highlight the links when you mouse over them so people can see the information provided. The site shows sizes of different popular foods. The problem is a lack of consistency. The pork chop is on a graph, the chicken is on a white ground, and the steak and salmon are on a plate on a graph. Get out your ruler if you want to eat Swiss cheese. There is a bar on the right side of each page with a list of related topics in no particular order. Maybe order of importance could have been used if they didn't want to resort to the tried and true alphabet. When you click the topics there is a "Key Consumer Message" at the bottom of each, except for proteins, oils and physical activity. That the USDA could not think of one take away for each of these groups tells me they are not thinking. Their message for the Empty Calories topic has some redundancy. Aren't eating less and avoiding over-sized portions one and the same. I guess if you can hear one hand clapping, I applaud the effort. 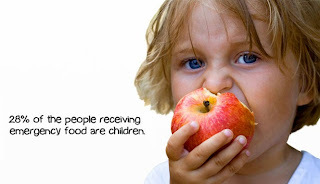 But it seems geared to kids and not the adults who purchase the food. Maybe the USDA is planning on rolling out TV ads because certainly the people who need to use the information are not sitting in front of their computers reading the fine print at choosemyplate.gov. And as a final note, where do we put our dessert? The New Food Icon - Are They Kidding? The New Food Icon - Divided Plate or Round?